Hitohiro Saito was born in 1957 and brought up in Iwama, where he started aikido at the age of seven, studied under Morihei Ueshiba as a child, and continued learning from his father Morihiro Saito Shihan. 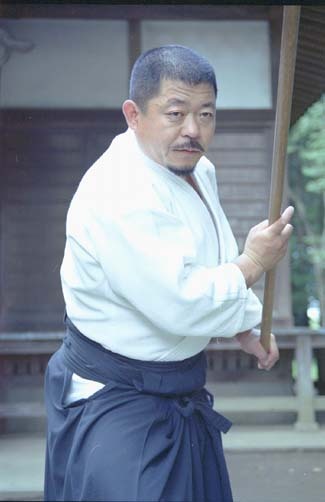 Devoted to preserving the spiritual and technical tradition of O-Sensei's aikido, (Iwama-ryu) Hitohiro has established a reputation for excellent technique and teaching methods in Japan, the US, Europe and Australia. We could feel his overflowing love and profound respect for his two masters ( the founder and his father ) during this exclusive interview. AJ : Hitohiro Sensei, what are your earliest memories of the dojo ? Saito : I used to share meals with O-Sensei and to be given what was left on his plate. I also remember crying in the mornings in my childhood because I could not find my mother beside me when I woke up.She was always away at the dojo helping O-Sensei. AJ : They say O-Sensei used to be very severe ? 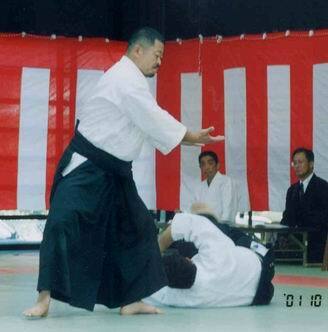 Saito : O-Sensei generally only demonstrated his techniques in other places, but he truly instructed in Iwama and was very strict. He would shout, " What kind of kiai is that! Go outside and see if you can down a sparrow with your kiai." Or, to someone applying a sloppy yonkyo, " Go out and try it on a tree! Keep at it till you peel off the bark "
Even as a child, I realized from the atmosphere around him that he was a great man. We all used to bow our heads from the moment Saito Sensei, my father, went to fetch O-Sensei , and remained prostrate until O-Sensei arrived with Saito Sensei following along behind. We finally raised our faces in order to bow with O-Sensei before the dojo shrine. Then we started training with tai no henko. If I was sitting next to Saito Sensei while O-Sensei was explaining a shomenuchi technique I would be sent up to execute a shomenuchi strike against O-Sensei. One day my older sister was told to go and attack O-Sensei, but she started to cry and left the dojo, as it was not easy for a child to go and interrupt O-Sensei this way. I was told to go instead and I struck with a kiai shout, at which O-Sensei said, "So, you came , did you?" He threw me, but used his hand to stop my head hitting the mat , and said, "Careful now." O-Sensei was such a kind person. AJ : How old were you then ? Saito : Around my second year in elementary school. O-Sensei was still vigorous in those days. In his last years he did long warm-ups, but at the time when I started aikido he used to teach more techniques. AJ : When did you decide to dedicate yourself completely to aikido? Saito : I didn't have much choice, since I am the only son, even though I was a lazy fellow when it came to training. (laughs) I planned to open a restaurant to be able to make a living while doing aikido. After high school, I went to Sendai for a year to learn how to cook, then I went to Osaka for a further two years of study. Whenever I had a day off, I visited Seiseki Abe's dojo and learned calligraphy from him. I also visited Bansen Tanaka's aiki dojo. Abe Sensei practices misogi by pouring cold water on himself every morning to purify his soul. He seems to express an ascetic mind through his calligraphy. Originally he met O-Sensei at Bansen Tanaka's dojo at Takahama: O-Sensei recognized a kindred spirit on the path of misogi, and began to learn calligraphy from him. AJ : We visited Abe Sensei a few years ago and saw some amazing scrolls done by O-Sensei. You can feel a spiritiual athmosphere as soon as you enter the dojo . Saito : Those scrolls are luminous, aren't they? To learn more about O-Sensei one should read his doka (poems) and study his calligraphy. Photos and video tapes give us certain direct feeling of connection with O-Sensei, but his poems and calligraphy communicate more subtly with us . They are truly wonderful and profound. AJ : Abe Sensei knows O-Sensei's poems very well doesn't he ? AJ : Did you do aikido during your apprenticeship in Sendai and Osaka? Saito : In Sendai, I trained under Hanzawa Sensei, and in Osaka I practiced at the Abe Sensei's dojo. AJ : Did you open a restaurant in Iwama as planned? Saito : Yes, in 1978, but I was young and foolish and used to drink a lot with the customers at night, and did not train very seriously. I ran the restaurant for seven years, but began to fear I would ruin my health, so I talked with my father and he agreed that I should get out of that business. He went abroad often and needed someone to take the charge of the dojo while he was away. That was 11 years ago and since then I have been teaching aikido full time. AJ : Eleven years ago I went to Denmark with Saito Sensei and participated in a seminar there. Last year was the 10th anniversary of the event, so I went back again with Saito Sensei and several people from Iwama. It was a great seminar with about 300 attendees. Saito : Saito Sensei says that all taijutsu, ken and jo techniques are based on hanmi. First you should master hanmi. Then, you have to learn how to do proper kiai. I think training without kiai is miserable. The founder had a marvelous kiai. If you want to learn true budo you cannot go wrong by trying to imitate O-Sensei. Unfortunately, people do not know much about O-Sensei, so I do my best to tell them more about him. The foundation of aikido training is forging yourself. You cannot do this if you start practicing ki no nagare (ki-flow techniques) from the beginning . The basic training consists in allowing your partner to hold you firmly. By doing so he is doing you a favor. Your partner restrains you and only then do you start practicing a technique. This is the first step on the path. One of the founder's instructions was to start with tai no henko. You should not neglect even one tai no henko practice. This is what we teach in Iwama. It is very important to train hard in tai no henko and morotedori kokyuho. Otherwise, one can't even start explaining ikkyo. When you pivot on your front foot and open to the rear, as in urawaza, you should be able to execute the proper movement of tai no henko, which is to bring the toes of your foot to meet the toes of your partner's foot. Your body pivots around the big toe of your front foot. Be sure to pivot properly, not just any old way. You need to harmonize with your opponent precisely, not in a general, vague way. You must start from this solid beginning. AJ : The precision needed for blending is a valuable point. Saito : Anyone can blend in a general sense, but one should begin with more specific forms which will ultimately expand to the universal harmony the founder spoke of. First you learn how to blend with your partner "toe to toe ," then how to pivot on your front foot. When you know how to pivot properly you will be able to execute an urawaza technique. One cannot express these things verbally; they can only be mastered by training. The founder said, "Practice comes first." It is not that your partner blends with you, but that you should blend with him in everything: "Move, open, then take the lead. " This is what O-Sensei taught Saito Sensei. A mistake of one centimeter could make it impossible to execute a technique successfully. You can't change the technique willy-nilly to suit yourself. There is a definite way to do each technique. Anyone, not just the physically strong, should be able to apply the techniques. Unfortunately, people neglect tai no henko. I can tell by watching people practice tai no henko and morotedori kokyuho what kind of practice they have been doing at their dojos. I do not need to see more. I think all the basics of the founder's taijutsu are contained in these two techniques and ikkyo. If you have not mastered tai no henko, you will always end up clashing with your opponent in the other movements. The basic training it to enable you to solve the problems caused by wrong body movement. This is impossible to explain in words, as it has a deeper meaning, but I feel the only way to learn is to allow your partner to hold you firmly. AJ : In some dojos teachers have their students practice the techniques after showing them only two or three times, without further explanation, but in Iwama you always give detailed explanations. 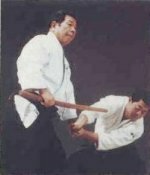 Saito : The reason Saito Sensei explains the techniques in detail is that he would like everyone to master each technique as quickly as possible. His teaching method is the result of making many mistakes himself over the years and learning from them. In his last years O-Sensei would demonstrate a technique as quick as a flash, then judge the students' ability from how well they understood it. As Saito Sensei wants everybody to improve more quickly than he did, he stops his students immediately when they make a mistake and teaches them in detail. He would not be able to do so if he had been doing easy training. If your partner yields to you all the time, you can't tell if you are executing techniques properly. By holding strongly your partner helps you to understand whether you are doing the techniques correctly or not. This does not mean he should hold in a nasty or devious way, although in such cases the technique can be changed to deal with the situation (Takemusu aiki). Your partner should hold you firmly, but correctly, then you learn to blend with his power. This is the basic training. If he takes a cross-over grip from above or below, you should change your response accordingly (Takemusu aiki). When your opponent comes to hold you, lead him skillfully. You lend your bodies to each other so you can train seriously. AJ : People often say that in aikido you can not measure your ability because your opponent collaborates with you. Saito : That is not true. You can always see if your technique is good or bad at every moment of the practice. If you have to make any unnecessary effort, feel your opponent is heavy, or clash with him, it is because you are not blending completely with him. You should be able to clearly identify what is wrong with your movement, or whether you did not open wide enough. There is no need for a contest to tell if techniques work or not. AJ : You mean your partner should attack you seriously in the training? Saito : Yes, if I say, "Thrust at me," he should trust with full power; if I say, "Strike me," he should strike hard; or he should grip me strongly. He should attack with all his strength and energy. Of course, if uke's strength differs considerably from his partner's he should attack with half power so nage can still learn. The founder maintained that practicing with a child was a good way to learn. Totally blending your energy with that of a child is a big challenge. Obviously some people are stronger than others, but if they injure their partner they commit an act of violence which is no longer aikido. Some people think that such violent practice is valuable, but I think it is disgraceful. The founder said we should enjoy our training, but it depends on you how enjoyable you make it. When you can sincerely say to your partner after the class, "Thank you very much. Please train with me again," that is the best kind of practice. If conflict arises between you and your partner and an unpleasant feeling remains after training, such training cannot lead to world peace, as the founder wanted. I want people to enjoy all my classes. Even if someone has an injury but still wants to train they should be accomodated. I advise students to tell their partners if they have a sore elbow or wrist. They can still train earnestly with their good arm. I tell people whose knees are bad to do standing techniques rather than kneeling techniques. We should not practice recklessly. The best training is when you care about each other. The founder advocated an open-minded approach and in Iwama you can still be touched with this feeling. He also said you can learn from anything you see, if you only want to. That is so true. AJ : Even though someone is unable to train every day, it is more important that their attitude is serious, isn't it? Saito : Yes. The founder said that even if you practice suburi hundreds of times, you are wasting your time if you don't put your ki into it. Ten times is enough if you devote all your energy to it. It is not a question of how many repetitions or how much time you spend training. You do not automatically become skillful after practicing for many years, and you do not have to be a poor student even though you have studied for only two years. It is a question of how seriously you cultivate yourself. Your training should have depth, and it is pointless to train casually. You should make the most of your training. No matter how few techniques you practice, always keep in mind that they should be effective in an actual situation. Be deadly serious in your training and do not waste a single minute. Sometimes I see people doing demonstrations where the techniques lack definition, even though they are trying hard. That is regrettable; they would do better to train thoroughly since they are putting so much time into it. One should relax and put forth all one's energy. AJ : Tohei Sensei says that although O-Sensei told his students to use full power, he himself appeared to be very relaxed and did not use strength. Saito : When O-Sensei said, "Use your full strength,"he may have meant, "Be deadly serious," or " Put forth all your energy." I do not think he meant people should over-exert themselves but to put forth all their ki from the bottom of their belly.Originally, he used to like to tell people to relax. When by letting go all your strength. " You should relax and yet put forth all your energy. AJ : This is a difficult concept to express in English. Saito : I find the same difficulty in Japanese. O-Sensei said in one of his poems, " A true martial art cannot be expressed by words or in letters. If you dare to try, God will not allow you continue. " I guess it means that you can't explain martial arts in words. You should learn through training, but at the same time, you should not assume an air of wisdom. He left two or three similar poems. Tohei Sensei is a really reputable man who has been very diligent in his studies. When I was a child, Saito Sensei used to say I should become his uchideshi. AJ : Some thousands of people have come to Iwama from abroad, and there must be many others who dream of doing so.Please tell us about the uchideshi life and the responsibilities this entails? Saito : There are two kinds of people who come to train in Iwama, uchideshi (live-in students) and sotodeshi (outside students). For an uchideshi, the dojo is home. At home you clean and wash your clothes everyday and keep your garden tidy; housework is shared by everyone. As the dojo grounds are very large, there are plenty of weeds and dead leaves, and without help for one or two hours a day we could not maintain the dojo. Some people have a problem with this Japanese custom and go home saying, "This is not what I thougt it would be." But uchideshi should be willing to do volunteer work and receive instruction with gratitude. Everyday the uchideshi have two practices, morning and evening. They can also practice freely during the day. Sotodeshi people attend only evening practice, although sometimes they give us a hand with the cleaning up on Sundays. Learning Japanese customs is most important. We must not break with the founder's tradition just because people from abroad come here. Coming to Iwama means coming to meet O-Sensei. This dojo has not changed at all from the days when O-Sensei was still alive. 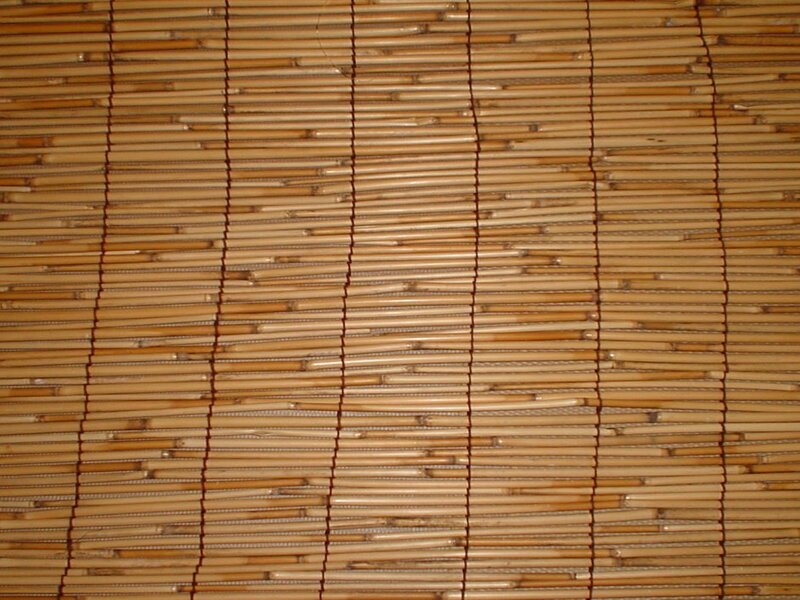 Probably the only thing we have changed is the tatami matting. Even the toilets have not been changed, they are the same as they were 50 years ago, and the bath tub is the same one that O-Sensei himself used. Coming here is like traveling back in time to those old days when O-Sensei was still alive. Although O-Sensei has passed on, here you can become one with him in spirit. In the morning if it rains we train inside the dojo, but in fine weather we practice ken or jo outside. This is very traditional training. This kind of dojo cannot be found in Japan any more let alone in foreign countries. This is a dojo where tradition is maintained not only in our training but also in daily life. Therefore I would like to uchideshi learn about Japanese tradition and at the same time train hard to become instructors. You can learn techniques and discipline your mind at the same time. Iwama offers such a great opportunity. AJ : Some people think there is no need to practice ken or jo in aikido . Saito : If it was possible to remove ken and jo from this world, you would not need to study them. 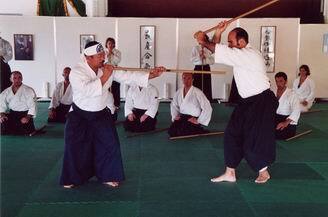 However, serious martial artists should learn about the bow, sword, jo and so on, since they exist. Learning about them means mastering how to use them first. The founder said, ken, jo and taijutsu are all one. Therefore, you should practice them. Apparently, if O-Sensei saw people swinging weapons in the Hombu Dojo he got angry with them, and he only demonstrated weapons techniques there, without actually teaching them. This may have been because all sorts of people came to Hombu to watch practice, and O-Sensei did not want visitors to see the ken and jo being used the wrong way. It would have been different if there had been someone who had diligently studied weapons from the beginning, working their way up under the founder. If O-Sensei had seen someone execute suburi exactly as he wanted, I think he would have smiled on their training. But, if people were playing around with the weapons or trying out iai techniques, O-Sensei would probably get angry and stop them. I met one of those who made O-Sensei angry in this way but he said that O-Sensei did not say "Do not use weapons," but "Who gave you permission to practice weapons? " Saito Sensei worked 24-hour shifts with the railway, so was able to practice weapons techniques under O-Sensei every other day, all day long. When Saito Sensei taught weapons techniques at his Sunday classes at the Hombu Dojo, O-Sensei watched with a broad smile. Once in my childhood, when Saito Sensei was teaching jo, I picked up a stick and imitated the 31-jo kata, I heard later that O-Sensei watched this from his room with a smile on his face. I think it was a matter of whether or not people were doing weapons techniques in the way O-Sensei taught them. Fortunately we have Saito Sensei as a wonderful model. We should copy his example, then, individually take a bigger leap. This is takemusu aiki, the individual's own creation. If you have never used weapons, you would not know how to cope with a situation where you are really attacked by a weapon. However, I would not insist that all who aspire to master aikido must do weapons training. The founder practiced weapons, and weapons exist. That is why we practice them in Iwama. There is nothing more to it. AJ : Everyone agrees that the spiritual aspect is very important in Ueshiba Sensei's aikido; what do you do for spiritual training? Saito : I don't do a great deal. My grandparents' house is behind Mt Atago in Iwama. About six years ago I performed misogi under a waterfall there every day for a little over a year. I did not miss one day, rain or snow. Then one day I read an article about an interesting old man, called Sasame, living in Mt Otake at Okutama in Tokyo. The article said he had met Onisaburo Deguchi, so I felt the urge to visit him. After imprisonment in Siberia during the war, Sasame was repatriated the year I was born (1957) and later that year visited Iwama. He met O-Sensei in Tokyo, and was advised by him to go to Iwama to pray at the shrine and recuperate from the effects of his imprisonment. But he went back to Tokyo because he was afraid O-Sensei and he would quarrel, since they were both rather stubborn. I learned a lot philosophical matters from Sasame Sensei. Unfortunately, he died this year. He had also a close relationship with the Omoto religion. He was not a follower exactly but the spiritual discipline he taught was related to the Omoto religion in the old days. Sasame Sensei said, " Ueshiba Sensei must have sent you to me, " and I had the same impression. AJ : There is a book by O-Sensei called “Budo” written in 1938. Would you tell us about this? Saito : That book was written when O-Sensei was still vigorous. 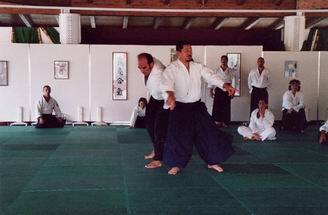 The founder's aikido did not have the same form in the begining as seen in his last years. 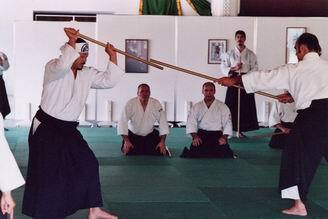 In Iwama, aikido has remained almost exactly as it was when the founder was in his prime. It is very important book to learn about the founder and the history of the techniques. It is a treasure, I wish there were more works like this showing O-Sensei's aikido as he performed it in his 50s and 60s. 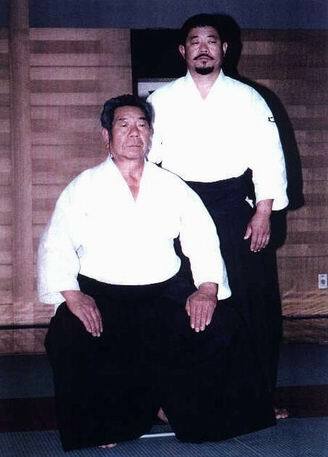 Saito Sensei will soon be 70, so those who start aikido now cannot know how he was in his youth, except for the little they might get through video tapes and books. 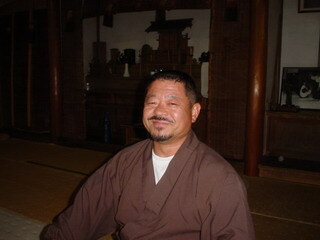 However in the dojo, there are people who have been studying since Saito Sensei was young. Through these seniors one can get to know how Saito Sensei used to be. The relationship between people in the dojo should be like a pyramid. O-Sensei is at the top, followed by Saito Sensei, and then the senior students on the next level. One should learn from the more experienced people. It is also helpful if one can find other materials to learn from, and the book is a wonderful example. Techniques do not remain in the dojo but live on inside the individual. AJ : How do you think aikido will develop from now on ? Saito : It depends on each individual's attitude. If you are prepared to discipline yourself strictly as the martial way requires, I think aikido will expand infinitely. However, it will not progress at all if you train with a partner who just collaborates with you without ever attacking you seriously. 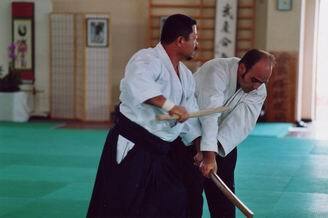 It may be a different matter if you are practicing aikido solely for health or friendship. Otherwise nobody will go beyond the founder. In the sumo world, people return their seniors' kindness by throwing them. We can return the founder's kindness by going beyond him. I might sound arrogant but I think we should train with such an attitude. We should all make a deep study of Saito Sensei. This is the goal for those who train in Iwama. You should always observe Saito Sensei and your seniors attentively so that you can cultivate yourself profoundly. Having the teachings of the founder and of Saito Sensei as a foundation, I would like to train hard and share with everyone, without spilling it, the water O-Sensei drew from the well. We have a responsibility for this. Saito Sensei carries the biggest burden, and I have to make sure I receive the same water from him. All those who are at the dojo now should receive it also and give it to those who follow us - although we should drink a mouthful first (laughs) Drink first and hand it on; this means to preserve this wonderful tradition. First of all learn about the founder, then add your original ideas and take a leap. Before passing away the founder said, "Continue to do what I leave undone" We need to ask ourselves every day what it is that the founder left us to do. AJ : You are going to succeed Saito Sensei and maintain the tradition, but is there anything else you would like to add or achieve ? Saito : I think Iwama aikido is fine as it is. If I wanted to add anything personally, I would like to do more spiritual training, but I would not demand this from anyone else. I would like to do misogi as the founder did, even though what I do may be no more than imitation. Then I want to accept responsibility for preserving the traditional forms just as Saito Sensei has been doing with all his might. However, you can do nothing without good technique. If you become a carpenter through inheritance, but your skills are poor, nobody will give you work. Success depends on individual skill. I will make every effort not to shame my father's name, but it is nor so easy to live up to it. AJ : Hitohiro Sensei, could you please give our readers one more word to conclude this interview. Saito : I would like everyone to learn about O-Sensei's spiritual and technical teaching especially from the period when he was most vigorous,rather than his last years. They will surely find something original which differs from Daito-ryu. Daito-ryu is also wonderful and we should know about Sokaku Takeda Sensei, too , first I want everybody to study how O-Sensei used to be in his youth. AJ : I think it is important to have an attitude that says, " I want to go all the way to the point O-Sensei reached, " or " I want to go even further." and do our best, rather than measure how far we have already traveled. It matters how you live your life while you are still in good health and spirits. Saito : That's true. I want to say to those who sincerely desire to learn aikido, " Please come to Iwama, meet Saito Sensei and let him touch your heart and open your mind. " You just cannot find this kind of dojo anymore. AJ : Hitohiro Sensei, I really want to thank you for today.